This modification is called knife edging. Most manifolds these days come knife edged from the factory. However if you have a flat front surface on the plenum separator then you may gain a slight increase in performance by knife edging like so. 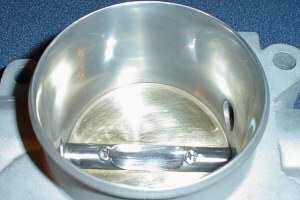 Mirror polishing in this area also helps to reduce restriction and improve flow. 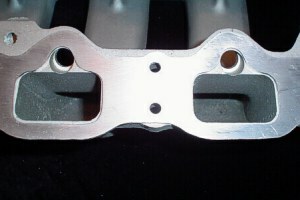 This is an un-modified KLZE inlet. Notice how in the photo to the left the shape is no longer rectangular as in the photo above. This is because there is a small amount of metal in that area which can be removed by a good porting machinist to allow a little more airflow. Also notice how the edges have been radiused.. This is called hourglassing the butterfly shaft in your throttlebody. 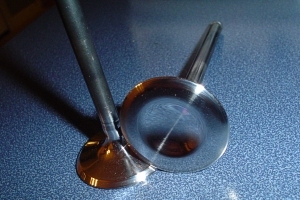 Many tuners opt to purchase an aftermarket larger bore throttlebody. But the larger diameter bore radically modifies the airflow at low RPMs and often negatively effects the range output of the throttle position sensor. This makes it very hard to get a good idle.. The hourglass mod preserves airflow at idle while improving top end flow because modification becomes more effective as the throttle approaches wide open position. 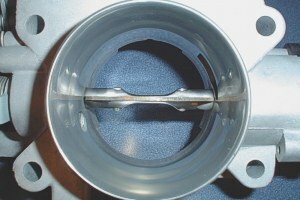 This is an un-ported KLZE Intake port looking in from the flange. There is a lot of improvement that can be made to improve stock intake and exhaust port flow on a KL motor. And here is the intake port after porting and a mild polish. Note the knife edged divider. Note: This kind of porting work should only be done by experienced head machinists. It is very easy to damage a set of heads if you do not know what you are doing. This is how a good head porting machinist will know where his limits are. This is the only way to be sure of the limits. 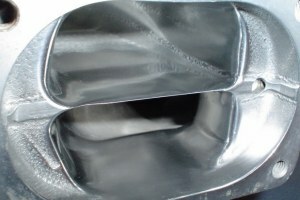 This is a porting template sitting on a KLZE intake manifold. 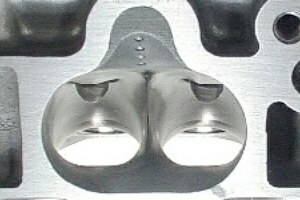 This is how a manifold is exact port matched to a set of heads. 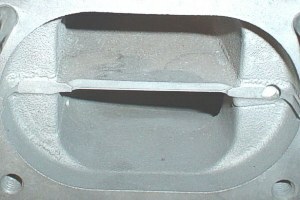 This reduces flow restrictions in the intake ports. This is an inake manifold runner after template port matching and mirror polishing.. 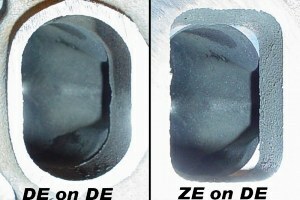 Many people are falsely led to believe that putting a ZE intake on a KL01 engine will improve power. But as seen in the photos above this actually creates huge obstructions in the airflow path and reduces low to mid range horsepower. There are some very minimal top end gains because of the reduced restriction over the long path of the runners. 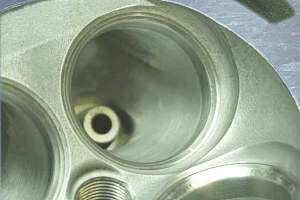 But when the flow reaches the head it has the same restriction it has with the KL01 intake. 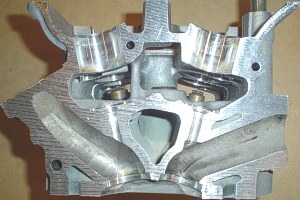 Notice the dimples in the injector recess. These are called injector turbulators. Some believe the theory behind turbulators is that as the fuel micro-droplets disperse away from the injector the turbulators re-direct the droplets back into to a convergence point where they collide and atomize into a fine mist. Others believe that it is the turbulence they create in the flow path that causes the fuel droplets to further atomize. Thus is the reason for their name. Turbulators can be either protruding or dimpled. 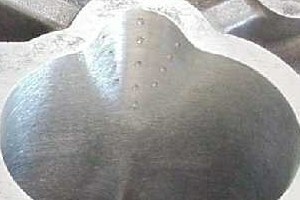 The recess machined lip around the valve seat in this photo is called de-shrouding. This increases the effective distance from the valve tulip to the chamber wall which allows more airfuel mixture to enter the chamber. 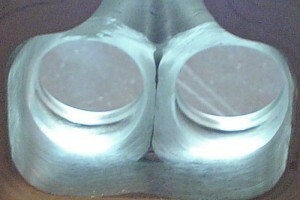 When valves are shrouded by the chamber walls the flow is restricted in that area. This is how to CC a set of heads. A clear piece of Plexiglas is glued to the surface with a small hole in it to fill the chamber with a fluid. Then the fluid is measured in each chamber and recorded. Material is removed from the smaller chambers until they are all equal in volume. 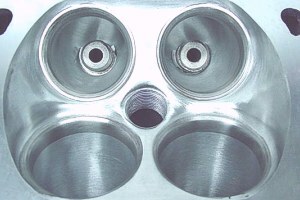 This is a polished combustion chamber. 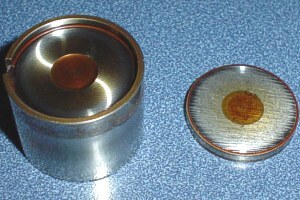 Polishing reduces hot spots or chances for pre-detonation in high compression or forced induction engines. 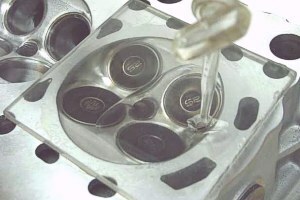 Polishing the valves also reduces possible hot spots and reduces carbon build up potential. This is a KLZE port matched KL01 intake manifold. Some very good potential can be unleashed from a KL01 intake manifold. The KL01 intake manifold has some very good torque characteristics so if you increase the top end with some extensive porting work then the best of both worlds can be obtained. This is a solid lash adjuster from a 2000 and up Mazda 626 KLG4 2.5L motor. 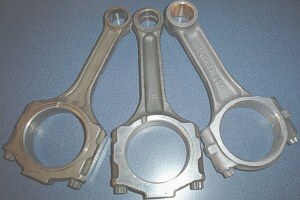 Mazda replaced the hydraulic versions in the late model engines to reduce valvetrain noise from sticky HLA's. These can be a good performance increase if used with some custom grind high lift and extended duration cams. KL01 Rod to the left, Millenia "S" miller cycle rod in the middle and Small Block Ford 5.4"length rod to the right. These are just a few rod options for the KL motors. 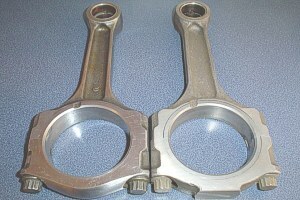 This is a highly modified Millenia "S" rod on the left compared to a stock one on the right. 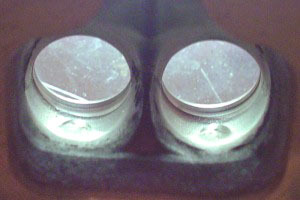 The one on the left has been lightened extensively and the beams were polished to eliminate stress risers. 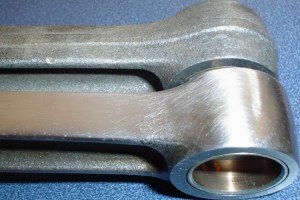 Removing the casting flash and polishing the beams on the rods removes possible stress risers which could lead to rod failure under power. 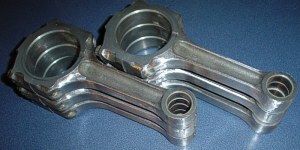 This is a meticulously balanced set of rods with polished beams. They are balanced to within a half gram of each other. It is ultimately important to balance an engine well anytime you alter the original rotating mass. If balancing is skipped then a catastrophic failure is very likely!